Christmas season is in full swing! It's such a perfect time to inject some familial heritage into the festivities, and keep Mag tapped into her roots between visits with Kam's side of the family. 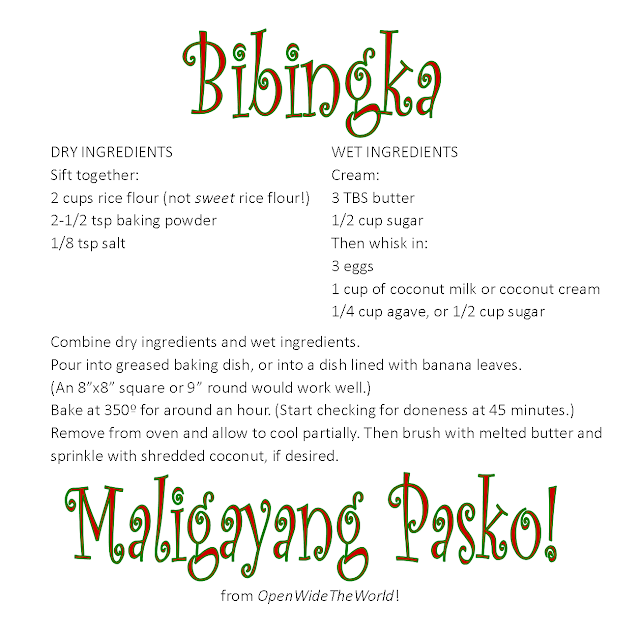 Of course, to truly embrace Christmas, Filipino style, we're about 3 months behind! Yep, that's right: in Philippines, the Christmas season encompasses the final FOUR months of the year! My Midwestern tendency, upon hearing this, is to imagine the cause is the shorter days/longer nights of the season. But we can't forget that, being so near the equator, the duration of daylight in the Philippine Islands varies by only about an hour between the longest night of the year and the shortest night of the year. So why do they do it, then, if not to escape the darkness of the long nights of the season? No one in the family has any idea... but is sure sounds fun! Well, here in the good ole U.S. of A., we can't incorporate a 4-month celebration into our current lifestyle. But our family has managed to enjoy some of Kam's fondest memories of childhood Christmases in Philippines, beginning with PAROL, or Christmas lanterns, which seem to be popping up everywhere this year (like here and here). 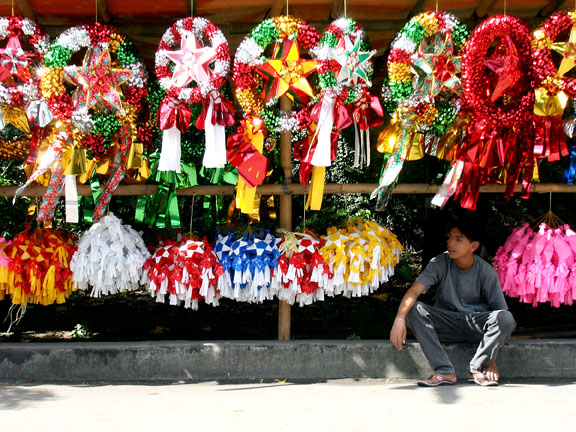 In Philippines, these Christmas lanterns can be small and simple, or enormous and elaborate. We made a paper version that children grow up making at home. 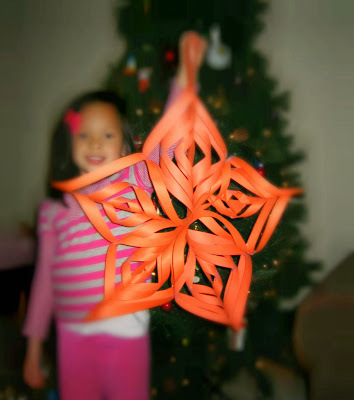 Since Kam couldn't quite recall the how-to of homemade parol all these decades later, we followed these very user-friendly youtube directions to recreate the memories. We made it into a family project, each person working on one "arm" of the star, with good results! 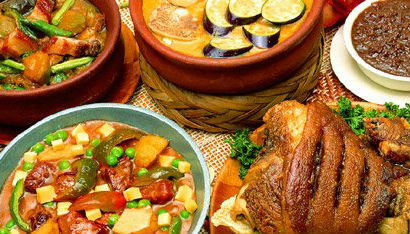 Of course, no self-respecting Filipino celebration would be complete without a FEAST! 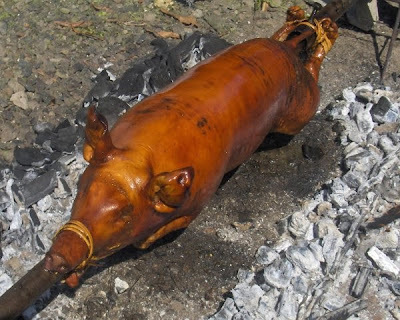 Traditionally, lechon (a whole roasted pig) would be served. Since we had just had lechon at Thanksgiving, we went a little more low key for our pre-Christmas Filipino feast. Our local Filipino grocer supplied beef and chicken empanadas (my fave!) and puto (steamed rice mini cakes). 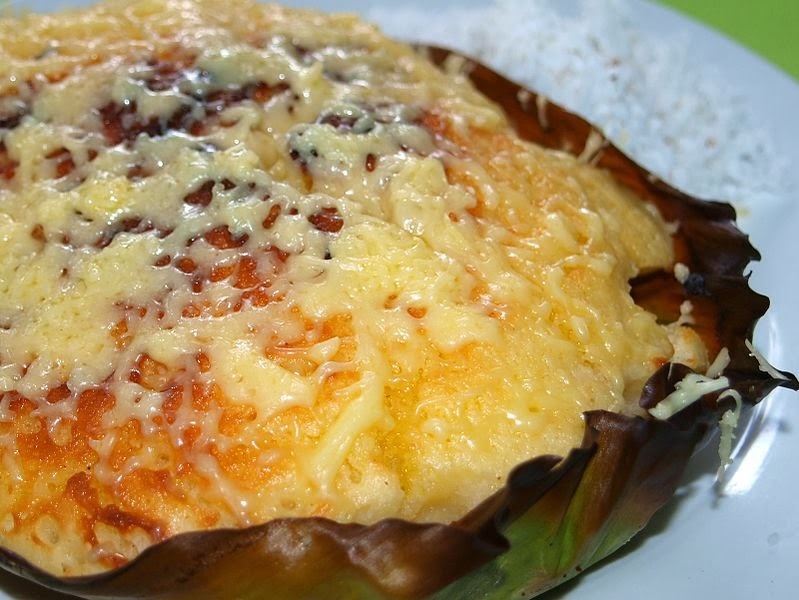 We made an enchilada-esque dish that was Kam's mom's recipe, and the pièce de résistance: BIBINGKA! 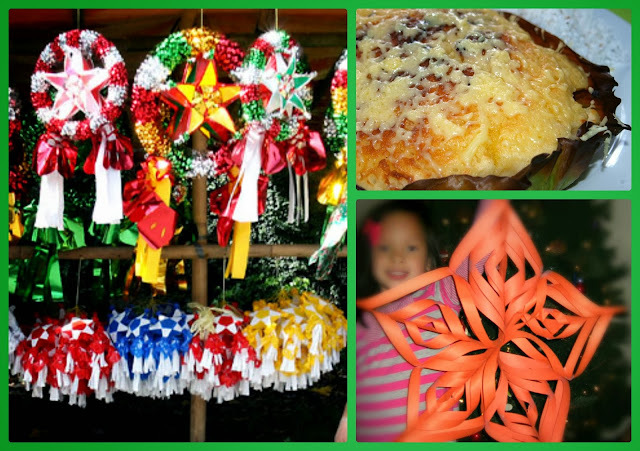 I hope you enjoyed this little peak into Christmas in Philippines. We had such a wonderful time celebrating Kam's roots this week that we are planning to incorporate more traditions into our festivities on Christmas day! Wherever you are, and however you're celebrating, I hope it is just as joyous! Merry Christmas! Love learning about "Christmas in Different Lands"? 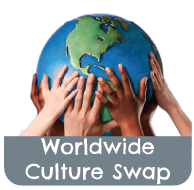 Head to the Multicultural Kid Blogs world tour... so many fun traditions, so little time! Remember my favorite childhood flashcard practice game that has been resurrected for Mag's Spanish endeavor? 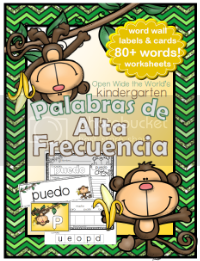 The December word list and the corresponding "Yo tengo/¿Quién tiene?" game have been added to the November set. Big Discounts at My Fave Language School!!! You might remember a while back I mentioned that when Mag was about 18 months old, we took part in a Parents and Tots French play group at a phenomenal center called Language Stars. Later, she also participated in Kids Only French and German classes there. While we loved the program, the center, and the wonderful teachers, we haven't continued with Language Stars since Mag began a language immersion program at school, surrounded by Spanish for 7 hours a day. But I have had it in mind to get her back into French once she seemed settled in her new school routine. If you live in Chicagoland, check it out! There are 14 locations in the greater Chicago area, offering 5 languages, and now a super awesome 40% discount for enrolling for the summer program before December 31st. Currently, there is also a 25% discount for the remainder of the academic year tuition. The Multicultural Kid Blogs: Christmas in Different Lands event begins today! Every day from now until December 24, bloggers from around the world will be sharing their local Christmas traditions. I'll be posting on December 21 with traditions from Kam's homeland of Philippines. You can get the complete schedule of bloggers and countries, as well as checking out the linky party of other traditions, crafts, and recipes of Christmas around the world, here. So grab a mug of gløgg and a buñuelo, and get ready a festive trip around the world! The Joys of Domestic Holiday Travel... Really! Yesterday we left the Midwest to spend Thanksgiving week in California with Kam's family; our first flight since our trip to Europe this spring. Previously, I would have preferred to remain home-bound rather than face O'Hare International Airport during the holiday season. What is it about ORD that is so disenchanting in the winter? The Chicago weather delays? Or maybe the fact that bad weather anywhere on the continent will somehow delay flights out of Chicago? I don't know, but whatever it is, I have spent far too many hours in lines at gates in ORD, waiting and hoping to get a coveted remaining seat on a back-up flight for my back-up flight. And then yesterday arrived. I was prepared for anything as we headed toward ORD, just days before the busiest travel day of the year. Being able to read the signs. All of them. Without thinking. Without using context. Without wondering what the symbols mean. I just love to be able to look up at a sign have instant access to the information I was seeking, especially in an airpot. Understanding the queuing system. I won't try to say the North American way of lining up in a neat and polite manner that respects the time and space of fellow queuers is better than other -ahem- systems. No matter where you're from, it's just easier to line up with people whose method matches yours. Clean restrooms. Okay, admittedly this experience will not be shared by all who travel domestically, depending on where your domicile is... but here in the States, it would be on rare occasion that I would cringe at the thought of a public privy. All the more important when traveling with a child! And my newfound favorite part of domestic holiday travel: TREATS! Treats? Really? Now, I'm not one of those people who sneaks around the big box mega discount stores, trolling for free samples... but I have to admit, I was pleasantly surprised to be met, not by weather delays at ORD, but by this happy scene, courtesy of American Airlines, and featuring apple cider (not just apple juice, but apple cider!) 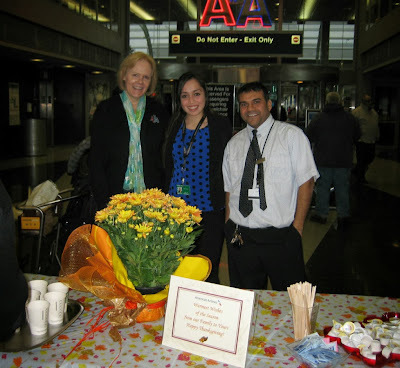 and Starbucks coffee, with a little sign offering holiday greetings from the American Airlines family, and three of the happiest airport personnel I have ever encountered! So thank you, American Airlines and Starbucks, for the pleasant entry to not just the airports, but to this holiday season! Anyone else who loves world travels find that you love the logistics of domestic travels just a little bit more? 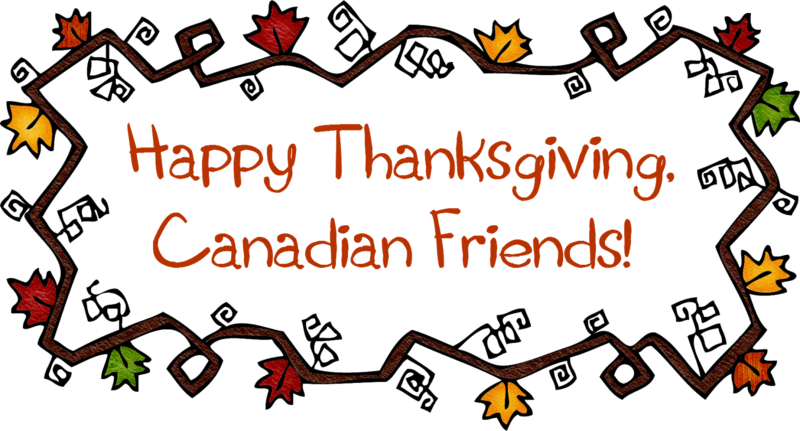 French & Spanish Thanksgiving FREEBIE! Kitchen Floor Woes, and a FREEBIE! When we moved to the Midwest a few years ago, we were so fortunate to find the perfect house. (Well, perfect for us. Maybe a tad small for the average Midwesterner, but we have different expectations.) I love almost everything about our home, with two exceptions, one of which is: the kitchen floor. Agh! I despise that hideous (and poorly laid!) dreary linoleum. It is so affreux that I didn't even mind when Kam dropped a knife on it and gouged a hole in it... or did I do that?.. It is just that horrid. But like many unpleasant things in this world, there is often a bright side. The bright side of this hideous piece of flooring is: flashcard races! We recently had our first quarter conference with Mag's wonderful Dual Language kindergarten teacher, Sra. C. She mentioned that reading groups will be starting up in December, and that we might like to practice sight words at home in the meantime. So I did what any TpT addict would do: I raced home to make some flashcards... oh, and bought a bag of M&M's, too! Right now, we're targeting 10 words, and soon we'll add another 10. If you'd like to join in with some flashcard fun, zip on over to my little store on Teachers Pay Teachers, and grab these flashcards for FREE. The current download also includes a game of "Yo tengo/¿Quién tiene?"... with directions, if you're not familiar with the game. I'll post an update when we add the next 10 words. Hope you'll join us in some flashcard fun... you're welcome to play along, even if your flooring isn't hideous! Just a quick update, since we have received many inquiries as to the status of Kam's family in Philippines. As of yesterday, everyone was safe and accounted for. In the next few days, a fellow Multicultural Kids Blogger will be posting a round-up of relief efforts. There are plenty of organizations at work, but Rina Mae has some on-the-ground contacts who are passing along info as to which relief groups have been the most effective at circumnavigating the looting and corruption, and actually reaching the people in need. I will share her round-up as soon as it goes live. Thank you all for the well wishes and prayers. 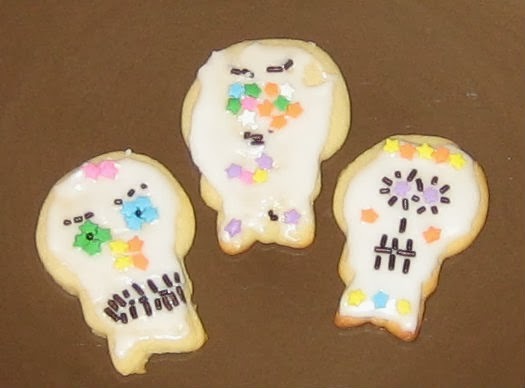 "Day of the Dead, at our place"
We always enjoy learning about different traditions and holidays from around the world (like this one). So, given that we spent years living just a stone's throw distance from Mexico, and that Kam's culture shares the same holiday, I don't know how Día de los Muertos, or "Day of the Dead," hasn't made our radar screen until now. This year, thanks to a quirky looking book on prominent display at the local library, Día de los Muertos has made it to our house. Mag inherited Kam's inclination toward the cutsied-up macabre (think Jack Skellington and the like), and thus was captivated by The Dead Family Diaz, by P.J. Bracegirdle. This book instantly rocketed to the top of our short list of family faves, primarily for the visuals, but the story is equally amusing. 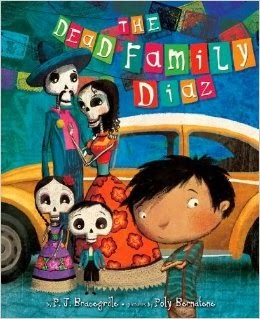 Once familiar with the new vocab, Mag was also enthralled by Calavera Abecedario, by Jeanette Winter, although The Diaz storybook still tops my list. 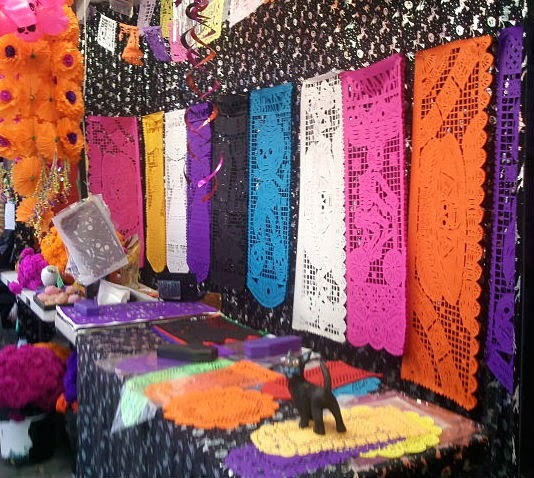 For a first Día de los Muertos celebration, I could almost leave it at books, food, and worksheets... but somehow crafts just seem to be calling out to be included. 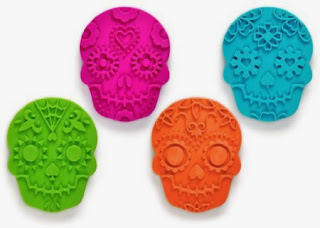 and finally these super fab-o calavera cookie cutters that I can't spend another November One without!!! I guess it's time to get a 2014 calendar, because I see a party taking shape already, 367 days in advance! With Mag getting full-day language immersion in school now, I have to admit that I appreciate no longer carrying the full burden of foreign language instruction. I do, however, enjoy supporting and supplementing her school exposure. To get Mag (and myself!) ready for her first Halloween in her new second language, I created a fun new FREEBIE, complete with word wall cards, an "I have/Who has?" game, and word search with answer key. 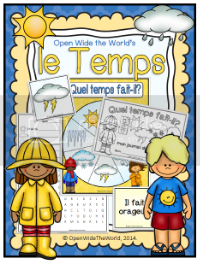 This freebie is available at my Teachers Pay Teachers store. Clicking the image will take you right there. Be sure to grab this now, because when Halloween is over, this freebie will disappear faster than a plastic pumpkin full of Kit Kats! Yowzers! My little Mag just lost her first tooth! Somehow I felt more prepared for her to go off to school than I felt for her to lose her first tooth. Sure, Mag was all excited at the prospect of the Tooth Fairy (which we didn't necessarily intend to introduce, but pop culture and school made that decision for us)... but me? You probably guessed it: my first thought was, "Hmm, wouldn't it be fun to hear how this is handled in other countries." So I asked a few blogofriends. British expat Amanda at Expat Life With a Double Buggy shares that she was able maximize the legend by convincing her son that the Tooth Fairy doesn't enter messy rooms. Genius! Now living in the Netherlands, Amanda notes that the "Tandenfee" does exist, but "is not a universally Dutch phenomenon. Some use it, some don't." A Bilingual Baby's Marta notes that in Spain, as in many countries, "it's not a fairy, but a little mouse. It's called el ratoncito Pérez." Apparently, in Mexico this little magic mouse leaves extra money for a front tooth. Ute of Expat Since Birth says that, "In German speaking countries we also know the Zahnfee, but she comes from the American/UK tooth fairy. In Italy the 'fatina dei denti' does the same as in USA/UK." Spanglish-House's Cecy has combined traditions, so her kids think that Tooth Fairy and Ratón Pérez are associated. Her eldest has developed his own tradition: leaving a tip to encourage them to come early. Wonder how the tooth characters divide the spoils? Would you prefer to avoid the Tooth Fairy tradition in your household? Never fear, there are parts of the world that are free of all tooth-taking characters. Olena (Bilingual Kids Rock), Olga (The European Mama), and Natalie (After School for Smarty Pants) report that there is no such legend in Ukraine, Poland, Russia, or Belarus. But if you have, by choice or by force, embraced some version of a tooth character tradition in your household, and would enjoy the chance to make it a multicultural event, Mari has some super cute Tooth Fairy Receipt printables, in several languages - yay! These are available at Inspired By Familia. Thanks for sharing, Mari! Want to read about more tooth-loss traditions from around the world? 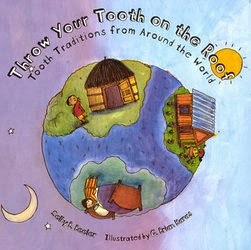 Kid World Citizen's Becky recommended a book that is now a family fave around here: Throw Your Tooth on the Roof: Tooth Traditions from Around the World. What country has a Rolling Calf who will take you away with your tooth if you're not careful? Which moms plate the tooth with silver and make it into a charm? Who asks the moon, a mouse, or a saint to replace their tooth? Which country has parents burying their children's teeth in university gardens? Don't you just love how a single tooth can take you on a world tour?! Thanks, Global Moms, for all the info. Any other great teeth legends out there? Remember that moment in "The Lion King" movie? Simba has been away for years, hiding from the pain of his new reality. After a long and patient wait, Rafiki realizes that the moment has arrived to call Simba back to his rightful place in the world. Three simple words emote the power of Rafiki's revelation: It Is Time. I get the chills and feel inspired every time I hear Rafiki utter those simple, but powerful words, perhaps because we all reach that moment in our own lives, the moment when the retreat must end. When the world requires our return. When we know beyond a shadow of a doubt: It Is Time. With that in mind, and Rafiki's words as my mantra, after a 2-month retreat, I feel the the blogging world calling, and moreso the Open-Wide World at large: It is time. Yes, Open Wide the World is still "en vacances"... but even when taking a break, a gal's gotta eat, right? And sometimes a special dinner just has to be written about. Check out my guest post over at MarocMama to see what Amanda has inspired me to cook while on hiatus. You can find her phenomenal recipe here. Mmmmm! I'll be trying out more of her recipes soon, sans aucun doute (without a doubt)! Ah, I just love blogging. I do. Or more accurately, I just love writing, and blogging is an exciting medium (not to mention a fun connection to a really neat group of fellow globe trekkers). Normally, at any moment in the day, I am probably either writing, thinking about writing, revising some writing, wishing I were writing, or counting the minutes until I have some free time to get in some writing. See a theme? But in recent weeks, you may have noticed the frequency of my posting has dropped off a little bit. Okay, quite a bit. Anyone who has lived past 35 probably knows that certain phases of life throw you things that demand your full attention, and I find myself in the middle of such a phase at this very moment. As much as I would love to continue blogging through the storm, I am finding that dividing my attention is getting me nowhere, on either front. And so, as of today, Open Wide the World is officially "en vacances" (on vacation). Wow! Just when you think you've seen it all in this great wide world, you stumble across something that surprises you. 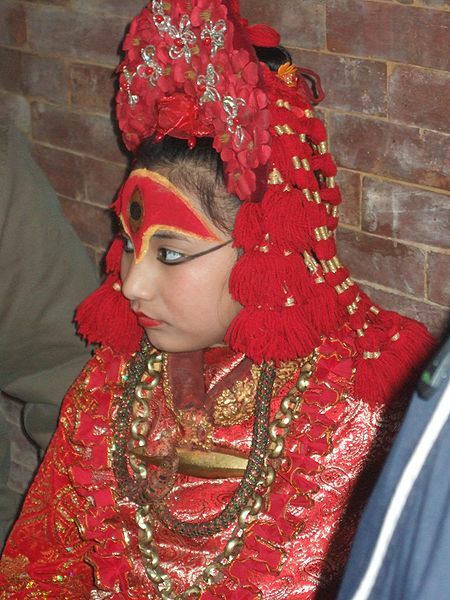 Without commentary or interpretation, I present the concept of "Kumari Devi," or a "Living Goddess" of Nepal. According to this theworld.org interview with Sonia Narang (listen here), a Kumari Devi is "a young girl who is chosen as young as 3 or 4 years of age. She is actually revered as a goddess. (Some) believe her to have the incarnation of the Hindu goddess Durga in her body. 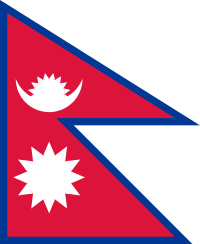 There are actually a number of Kumaris in Nepal. Each community has their own living goddess, and the locals will come out and seek her blessings." As for the selection process? Narang describes it as "quite intense. The highest caste girls from the community... are all assembled when it's time to choose a new living goddess. The temple priests put them through a series of tests. They are evaluated for their looks, and also for their fearlessness." The fearlessness is apparently tested by having the candidates, individually, enter a dark room with severed animal heads, spending several hours or even all night there, while maintaining serenity befitting of a goddess. And the life of a Kumari Devi? Narang tells us that a Kumari "is not allowed to go outside and play with other friends. She is confined to her house. She is allowed a tutor in recent years. She leads a very isolated life." She will leave the home for rare ceremonial occasions, at which time she will be carried, so as her feet never touch the ground. Narang adds, "You're actually a Kumari until you hit puberty. So these girls will end their term when they're 12 or 13... and they revert back to a normal life. They become a mortal again, at which point a new Kumari is selected." Read more and view some fascinating pictures here. What surprising customs have you encountered in your travels? HT to Kathy for this one! Pinterest Scavenger Hunt - July 21 Clue! You could win one of four fabulous prize packages! 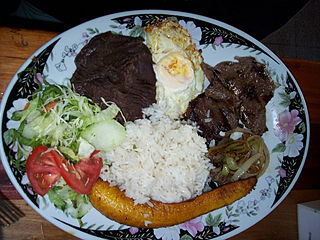 "The Sound Effects of International Food"
Now take a look around this site and try to find the post that fits the clue. Once you think you've found it, pin it to the Pinterest Board you've created just for this contest. Be sure to pop over to MotherTongues for the other clue for today. Don't forget to enter the Rafflecopter at the bottom for more chances to win! Create a Pinterest board specifically for the contest and name the board "Multicultural Kid Blogs Pinterest Scavenger Hunt." Each day a new clue (or two!) will be revealed. Follow the clue to the blog of the day and pin the post described in the clue. (Any image from the post is fine). In the Rafflecopter below, enter the link to the Pinterest board you created for this contest. The Rafflecopter will also have lots of other ways to earn extra entries. The only required entry is the link to your Pinterest board. The final clue will be given July 28. Participants will have until midnight Pacific time on July 31 to finalize their boards. The drawing will take place on August 1. Winners must have pinned all of the correct posts to their board. Winners will be notified via email and must respond within 48 hours or another name will be drawn. Please note: You can enter the Rafflecopter at any point during the contest. Obviously your board won't be complete until the end of the contest, but you can enter the link in the Rafflecopter before then. If your name is drawn at the end of the contest, your board will be checked at that time.Good luck, explorers! 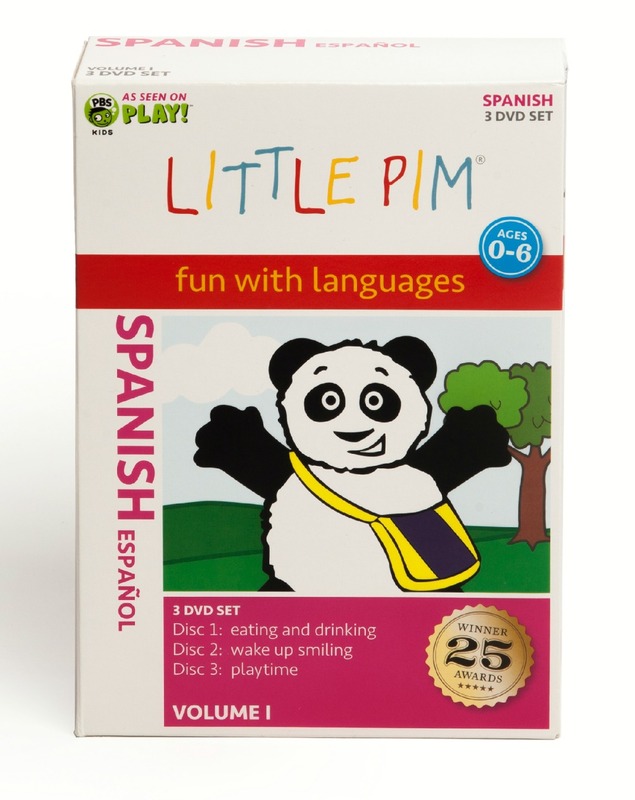 Language Learning Box Set 3 DVDs) from Little Pim ($49.95): The Little Pim Box Set Volume I is a great way to introduce young learners to over 180 words and phrases in the language of your choice related to daily routines, food, and playtime! Winner can choose the language of the prize from among those available from Little Pim. (US Shipping Only. If the grand prize winner is located outside the US, the Language Learning Box Set will become part of the 1st prize package). 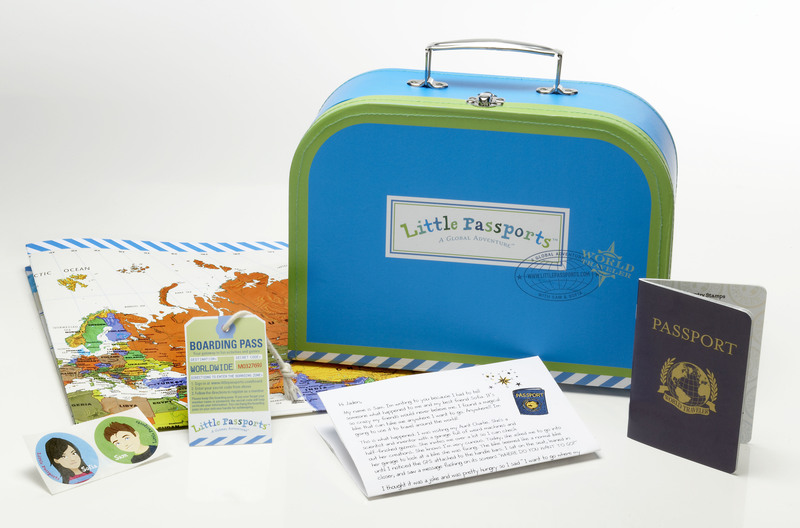 3 Month Subscription from Little Passports ($41.85): Little Passports is a unique subscription based service that can take your family on an adventure to learn about culture and history from all 50 states and across the world. With this educational, monthly package, kids will become excited about geography, history, and culture by following the world travels of characters Sam and Sofia on their magic scooter! Winner chooses between World and USA editions. 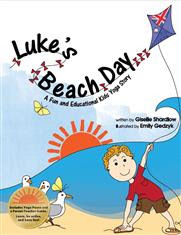 Luke's Beach Day storybook from Kids Yoga Stories ($15.95): Yoga-inspired story set on an Australian beach. The Skin You Live In book from Squishable Baby ($16): A book that celebrates the beauty in all of us. One copy of Be Bilingual: Practical Ideas for Multilingual Families (eBook) from Be Bilingual ($4.99): A well-researched yet highly readable book on raising bilingual children. Visit the Scavenger Hunt main page for a full list of additional prizes! Visit the Scavenger Hunt main page for a full list of clues as they are revealed. Final day to enter the contest is July 31, 2013, at midnight PDT. Drawing will take place on August 1, 2013. Yes, you read that right: we won the lottery! Unfortunately, it wasn't the state lottery that brings in millions (probably have to play it to win it)... but it was almost as good: we won the school district lottery to get Mag into our district's dual language immersion program! We are so thrilled to be able to offer her all the benefits of bilingualism, without having to take on the full burden of language instruction and immersion ourselves. Of course, the funny part is that the program is Spanish immersion. After 3 years of sneaking French into our daily routine, and a short focus on German, Mag will now be surrounded by Spanish for 8 hours a day. I have a feeling Mag will be exhausted for a few weeks. So I am slowly trying to give her more and more Spanish exposure now, in the hopes that the cognitive overload won't become emotionally overwhelming at the advent of the school year. 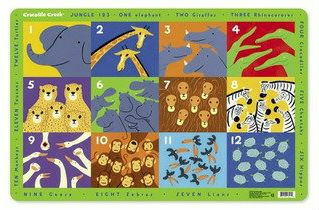 This pack includes activities and a game for learning numbers 0-10. 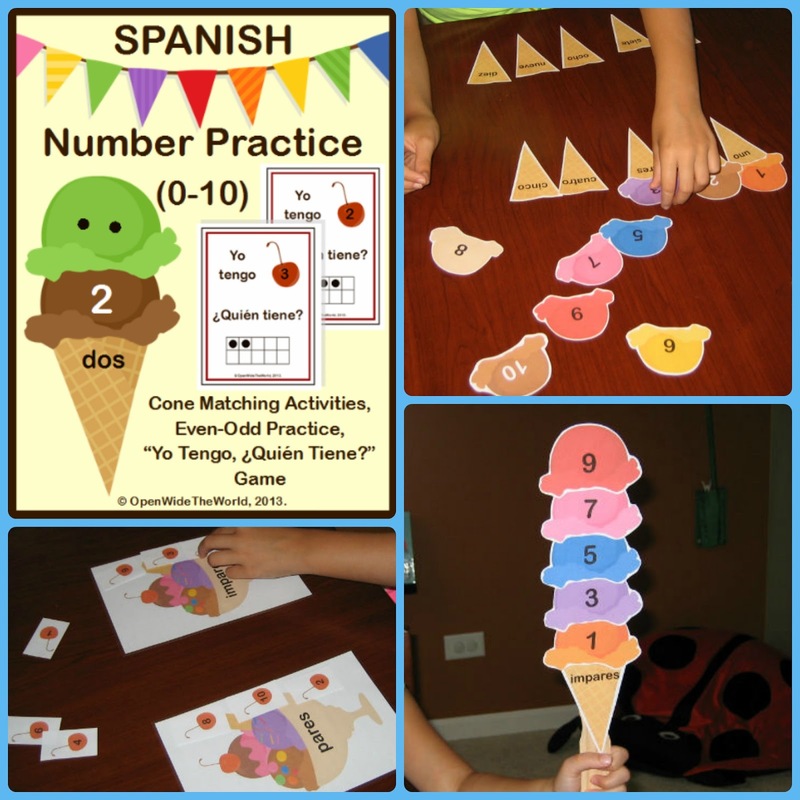 Use ice cream scoops and cones to practice matching numerals to written numbers, numbers to 10-frames, and numbers to scattered configurations. Make even/odd cones, and sort cherries onto even/odd sundaes. Try these activities at the tabletop, or with magnets at a magnet board, or with velcro on paint stirrers (which is our favorite). This pack is also available here in FRENCH! Hand out a card to each player. Players will get more than 1 card if fewer than 11 people are playing. It is important to use all the cards in the set. Choose a person to go first, and have him read his card aloud. E.g., "I have 10. Who has 6?" The person who has the card with the answer reads that answer aloud: “I have 6”. This person will then read the question at the bottom of his card, "Who has 3?" Then the person with the card that answers that question responds. Every card in the set is connected to a card before it and a card after it. Play continues in this fashion until all of the cards have been played. The game will end with the same person who started play. Having married into an Asian/Islander family, I am often reminded how different table etiquette can be across cultures. As a child, I was overtly taught to chew with mouth closed, don't slurp, etc. My husband's culture doesn't overtly teach eating etiquette, but children learn through observation that a certain degree of sound effect is acceptable, even polite, when eating. What might seem to be lack of manners in one culture is actually another culture's version of showing approval for the meal. My cross-cultural dining/marriage experience has got me fascinated with table etiquette across the globe, beyond the stereotypes that we've all heard about burping and slurping at the Chinese table. Amanda at MarocMama has a helpful list of to-do's and to-don't's about eating Moroccan-style, including: do wash your hands before eating, do not use your left hand for eating, do not use the same piece of bread for a second dip into the communal dish, do eat from the section of the communal dish in front of you. Stephanie of InCultureParent learned that last one the hard way, when, at the end of a big family dinner, her Moroccan husband told here she had been eating a great uncle's food the entire night! 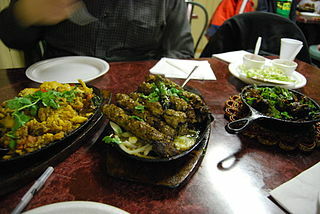 When CoreyAnn of Adventure Bee married a Pakistani, she learned to eat many more foods with hands rather than silverware. Naan or other breads are often used as the main carrying tool for food from plate to mouth, with some dishes allowing the use of silverware. Now in Malaysia, CoreyAnn relates that every little morsel is picked up with fingertips, including the curried & spiced dishes that stain the hands! Fortunately, there is often a "ketor" in place for rinsing the fingertips. Kathy, a returned Peace Corps Volunteer, remembers learning a very specific posture of the right hand to be used for eating, but said that she could remember little else of the specifics of table manners in Nepal, for an interesting mix of reasons: As a Westerner, she was outside the "caste" system; being casteless defaults to being the in lowest class, in which case one would rarely be invited to eat inside a Nepali home. Rather, a dinner invitation might find you seated outside the home, even while being served the same food the family is eating inside. The occasions that Kathy found herself eating indoors with a hosting family, she relates that she cannot comment on eating habits, as she never looked directly at fellow diners across a table. Rather, Nepalis generally sit in a row on mats on the (dirt) floor, side by side with anyone else who is eating. It appears that in Nepal, eating is more of a utilitarian function of survival, not at all the social event it is in the First World, therefore dining etiquette is a non-issue. Lawyer turned CEO of Travertine Spa Collection, and international foodie, Terry has eaten in Michelin 3-star restaurants around the globe. 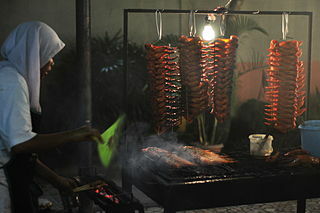 Yet his fondest international eating experiences have come from street vendors in Malaysia. Among other vendors (deep fried sweet potato balls, roasted chestnuts, deep fried bananas, fresh star fruit juice), satay vendors are everywhere, and each has its own unique flavor. Terry recalls regularly coming home from work, quickly changing into a lungi, and buying thirty sticks of satay (with red onion, cucumber and peanut sauce) to enjoy informal dinners with friends on a condo terrace overlooking the Petronas Towers. 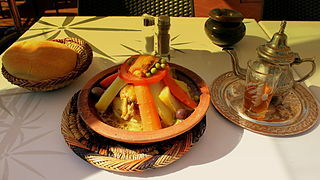 Despite the informal company, talking while chewing is seen as impolite, and burping at the table is generally not a compliment to the host in this country. Crianza of Spanglish House points out that there can be much variation by family, no matter the culture. This is certainly the case for Leanna from All Done Monkey. Despite the fact that Costa Rican families generally enjoy long family dinners (think: hours!) together, Leanna says her husband's Costa Rican family rarely eat together, presumably because it is such a large family that it is easier to eat in shifts. Shift-eating is something I'm still trying to wrap my head around in the Filipino eating circuit, too. Or, more accurately, how one understands how long to wait before taking food when the host offers it. I have been plagued for years by the awkward uncertainty of the point at which it really is okay to take the food being offered. Somehow, though, I always do end up getting more than enough to eat! Any funny or educational stories from your travel dining experiences? Today is le 14 juillet, which we anglophones know as "Bastille Day," the day the French commemorate the storming of the Bastille. The most common images that come out of Paris on this day are from the morning military parade, which is the oldest and largest of its type in Europe, not to mention the quintessential images of fireworks over the Eiffel Tower. But have you seen the lighter side of Paris on La Fête Nationale? Je vous présente: la Course des Garçons de Café, or "the Waiters' Race." (Pardon the somewhat "unique" narration style or this clip. Completed in standard servers' attire while carrying a tray typically laden with water or champagne and glasses, servers were traditionally disallowed from running during this 5 mile race through Paris. Over the years, the race has evolved somewhat, but still retains its very distinct Parisian flavor. Today, this jovial but competitive race is run in many cities in France, en effet (in fact) in many cities across the globe. And indeed it is no longer restricted to the 14th of July. In fact, the biggest running of the race is possibly the May event, sponsored by France's beloved Orangina soft drink. But autrefois (in other times), la Course des Garçons de Café was traditionally scheduled on, or very near, le 14 juillet. After all, what says "let's celebrate France" better than waiters trying to prove who's le top? 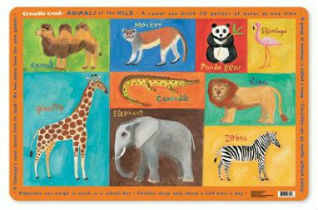 Coming Soon: Multicultural Kid Blogs Scavenger Hunt! Remember summers of childhood, back in the day: endless hours outdoors, going on imaginary adventures, not a worry in the world, except maybe bug bites and sunburn? Once adults, those memories become larger than life, don't they? We long for those once-carefree summer days full of adventure. Never fear! 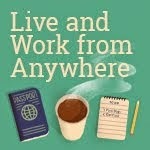 A tech-savvy, grown up summer adventure is on its way for the kid in all of us! Beginning next week, the newly revamped Multicultural Kids Blogs network is hosting a Pinterest scavenger hunt. Over the course of 2 weeks, participant-adventurers will have a fun opportunity to visit many of the blogs in the Multicultural Kid Blog network, including Open Wide the World, in a search for clues. Adventurers will pin their answers to a special Pinterest board, and be entered to win some fabulous prizes! More details coming soon... or head here to learn more now. Open Wide the World is finally on facebook! To kick things off on my new fan page, I'm offering a cute and quick color-matching activity, FREE to all new fans. Just like my new fan page, and the activity is free to download. Enjoy! In my last post, you might remember I mentioned reader Jennifer's concerns about having lost some of her cultural heritage, and her interest in reintroducing her language of heritage to her young son. With my own family having immigrated to this country in a time when it was deemed beneficial to lose all traces of the Old World and just blend in, this topic is near and dear to my heart. According to linguistic anthropologist Shirley Brice Heath out of Stanford University, it takes FIVE generations to remove cultural influences from our values and beliefs, and that is without nurturing the culture in question. That's great news for Jennifer, who only gave up about ½ a generation of nurturing her culture. It is even good news for me, a third generation American, whose culture has not been nurtured at all for 3 generations. It's still in there. It is still a part of who I am, a part of how I view things, a part of my life paradigm. With a little careful planning and purposeful pursuits (like the ones you see here at Open Wide the World), and maybe a few more trips to Europe, my family can reclaim the missing half of our cultural heritage. And so can Jennifer's. And yours! 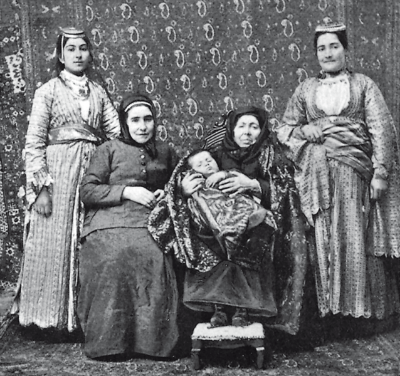 From early in the course of this nation's history (the U.S., that is), immigrants have either wanted to, or were often forced to, assimilate to the prevailing culture and language. While that trend seems to be slowly changing, generations of families have lost touch with their cultural and linguistic origins. Such is the case with reader Jennifer: when she was growing up, she was somewhat embarrassed to use her family's native language of Spanish, and preferred to speak English exclusively. Now an adult, she regrets that decision, and hopes to create a different language vision for her own young family. Fortunately, in today's world of endless e-resources, it is becoming easier and easier to reconnect with one's roots. Yes, you read that right: placemats. Three key elements will help explain placemats as my starting point to introduce foreign languages to my then-18-month-old daughter. 3) This one was the kicker: I have absolutely no French language experience with anyone under the age of 13. Therefore, I don't know kids' vocabulary (like toy names) in French, or French story grammar (as in "and they lived happily ever after"), or many French "comptines" (nursery rhymes), or many French expressions used with children (like "faire dodo," kiddie slang for "to go night-night"). Basically, I didn't know any age-appropriate French to teach my daughter. And then one day, as we were sitting at the table for snack time, inspiration hit! On the table in front of Mag, covered in puffs and cheerios, was a placemat by Crocodile Creek, with pictures of animals. In the sing-songy intonation of American "motherese," which I could only hope worked in French, too, I said, "Qui voudrait un cheerio?" (Who would like a cheerio?) And then I answered myself, still in sing-songiness, "Le cochon. Le cochon voudrait un cheerio." (The pig. The pig would like a cheerio.) And I set the snack on the pig. Then Mag ate it. After a few rounds of that, I asked the question "Qui voudrait un cheerio?"... but this time I waited for Mag to choose an animal by pointing to it. I then said the animal's name in French, and gave it a cheerio. mommy says "qui voudrait something-something,"
and Mag gets to eat the treat. 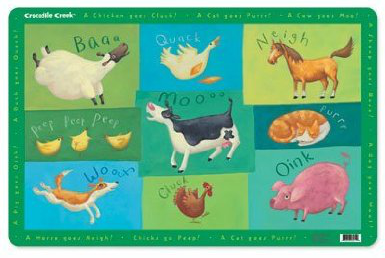 I began to feel as if the sky were the limit: we changed placemats to learn new animals, switched up the sentences ("Qui a faim?" Who is hungry? ), used the routine with toys instead of placemats. You name it, if it was in my grown-up repertoire, we adapted it to a child's level. Sure, I still can't teach my daughter the typical vocabulary a French 5 year old uses. She will not become fully bilingual under my tutelage. 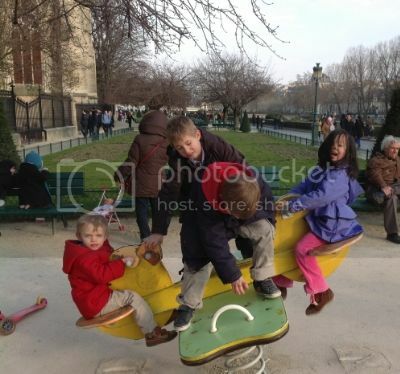 Nevertheless, she was completely comfortable playing with French children in the parks of Paris, and interacting for hours with her French "cousins." Despite the limitations of my French, Mag's language level made her feel at home enough in France to regularly ask when we can "move back." Success, in my book. And it all started with a placemat! Any other not-fully-bilinguals teaching their children their second language?